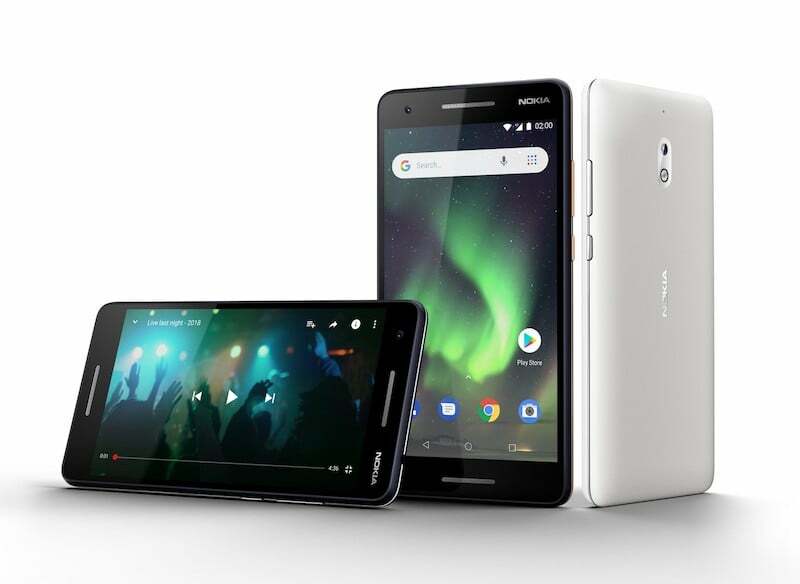 Alongside the Nokia 3.1 and Nokia 5.1 smartphones, HMD Global also announced the upgraded version of last year’s Nokia 2. 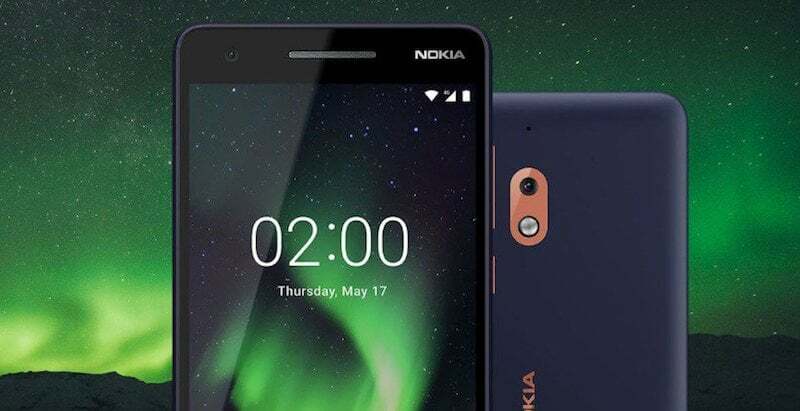 As expected, the device is monikered as Nokia 2.1, and this time around, the company has gone with the Android Go lightweight OS, unlike the Nokia 2 which runs the standard version of Android. Alongside improving the internal hardware, HMD Global also increased the screen size in the latest version, which is possibly the unnecessary change because the Finnish upstart brand has gone with the traditional 16:9 panel, not the trendy 18:9 panel. But the best feature added by the company is the two front-firing speakers and yes, the Nokia 2.1 too lacks a fingerprint scanner. The Nokia 2.1 comes with modest hardware which is alright for the asking price. It rocks a 5.5-inch display on the front with 720p resolution. It’s a 16:9 panel, not the 18:9 one as mentioned. On the brighter side, HMD has added stereo speaker setup on the Nokia 2.1, which is the highlight of the device. To recall, the original Nokia 6 had stereo speaker setup, but it was replaced by a mono speaker setup in the Nokia 6.1 and various other Nokia smartphones in the mid-range segment. The chipset used to power the Nokia 2.1 is the Qualcomm Snapdragon 425, which is an octa-core chip used on other smartphones such as the Xiaomi Redmi 5A, Tenor D and the recently launched Mobiistar CQ. HMD promises 50% performance boost on the Nokia 2.1 when compared to the Snapdragon 212 SoC-powered Nokia 2. Accompanying the chipset is 1GB of RAM and 8GB of internal storage, which can also be expanded with a microSD card, thankfully. Moving on, the Nokia 2.1 boots Android Oreo (Go Edition) out of the box, meaning it comes with all the light apps from Google. This is HMD’s second Android Go Edition smartphone; the first one was the Nokia 1 which was launched at the MWC 2018. Cameras in the Nokia 2.1 remain unchanged when compared to the Nokia 2. There’s a primary 8MP sensor to the back, followed by a 5MP sensor on the front. The phone is still backed by a 4000mAh battery, which is rated to deliver two days worth of battery life on a single charge. Another best part is the phone comes with a USB Type-C port. Connectivity options in the device include 4G LTE, VoLTE, Wi-Fi 802.11 b/g/n, Bluetooth and GPS. The Nokia 2.1 comes in three colour options- Blue Copper, Blue Silver and Gray Silver. The device will be available starting July at a global price of $115 (approx. Rs 7,683). However, it could be launched at the same Rs 6,999 price tag as the Nokia 2. It doesn’t come with USB Type C according to Nokia website, where did you guys come up with this info? 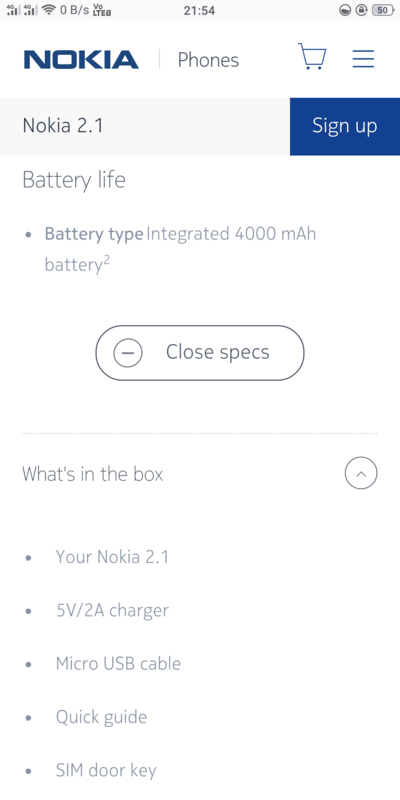 The “What’s in the box” data in the Nokia website mentions a Type C USB Cable.